Home > Making a Will > Why Make a Will? Death is not a pleasant thing to have to think about. The vast majority of people would prefer to be able to put it to the back of their mind forever, which is perhaps why as many as 60% of the British population will pass away without having made a will. In fact, a considerable number of people simply assume that they don't need a will. Common misconceptions preventing individuals from drafting such a document include the idea that your assets will automatically go to your spouse; that your estate is too small to warrant a will; or that the process is too complicated or costly. In reality, none of these are true. Leaving a will is guaranteed to make an incredibly difficult time much easier for those close to you. Dealing with intestacy after the death of a loved one is a very stressful, upsetting process, and should be avoided at all costs. The simple act of writing a will can prevent considerable hardship after your death. Writing a will allows you to have the final say over what happens to your assets after death. This may be very simple (in most cases, it is wished that the estate will simply pass to the deceased's spouse), or it may involve various complexities in order that your estate is divided in a satisfactory manner. In either case, if you wish for your affairs to be dealt with in the way you intended, a will is your only guarantee. The division of assets after death is not as straight-forward as many people believe. 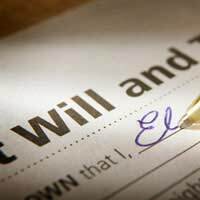 If you die without a will, your estate will be passed on in strict accordance with intestacy laws. In this way, your spouse will be entitled only to the first £200,000, along with your personal effects. After this they automatically receive 50% of what is left, but the remainder will be split between the next closest relatives. If you have assets totalling more than £200,000, therefore, failing to stipulate that you wish for your entire estate to be passed to your spouse will mean that other relatives will become beneficiaries, even though this was not your intention. Writing a will can also be vitally important in order to minimise the tax that must be paid on your estate. The intricacies of Inheritance Tax (IHT) are looked at elsewhere on this site, but you should note that by providing, for example, for a simple discretionary trust, you can avoid the payment of considerable sums. With IHT currently at 40%, your beneficiary will surely be grateful to you if you can minimise the taxable amount. One of the most important considerations for many people when writing a will is provision for their children. If you are a single parent, or if both you and your children's other parent die simultaneously, intestacy laws mean that guardianship of your children will be decided upon by the courts. Most parents would go to great lengths to avoid this; by making a will, you can stipulate individuals to become guardians of your children, thus removing any uncertainty. I just read what I said and I meant to say if you are the witness to the signing of the will. If a person is living as if they are the beneficiarie's husband, can they witness the will. They are not married, but for all intents and purposes, they are. I have read that if you are the spouse or civil partner of a beneficiary of a will, the beneficiary may not receive anything from the estate. What about a partner of 20 years or the boyfriend of the beneficiary?